If you want to create a moving light source, you have a few possibilities. One is to mount a light emitter in some kind of mechanical housing—the approach used in, say, theatrical spotlights, which stagehands swivel and tilt to track performers. Another possibility, however, is to create an array of light emitters and vary their "phase"—the alignment of the light waves they produce. The out-of-phase light waves interfere with one another, reinforcing each other in some directions but annihilating each other in others. The result is a light source that doesn't move, but can project a beam in any direction. Such "phased arrays" have been around for more than a century, used most commonly in radar transmitters, which can be as much as 100 feet tall. But in this week's issue of Nature, researchers from MIT's Research Laboratory of Electronics (RLE) describe a 4,096-emitter array that fits on a single silicon chip. Chips that can steer beams of light could enable a wide range of applications, including cheaper, more efficient, and smaller laser rangefinders; medical-imaging devices that can be threaded through tiny blood vessels; and even holographic televisions that emit different information when seen from different viewing angles. In their Nature paper, the MIT authors—Michael Watts, an associate professor of electrical engineering, Jie Sun, a graduate student in Watts' lab and first author on the paper, Sun's fellow graduate students Erman Timurdogan and Ami Yaacobi, and Ehsan Shah Hosseini, an RLE postdoc—report on two new chips. Both chips take in laser light and re-emit it via tiny antennas etched into the chip surface. A wave of light can be thought of as a sequence of crests and troughs, just like those of an ocean wave. Laser light is coherent, meaning that the waves composing it are in phase: Their troughs and crests are perfectly aligned. The antennas in the RLE researchers' chips knock that coherent light slightly out of phase, producing interference patterns. 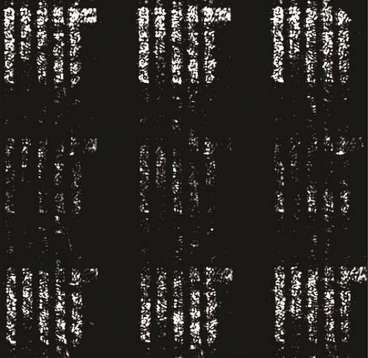 In the 4,096-antenna chip—a 64-by-64 grid of antennas—the phase shifts are precalculated to produce rows of images of the MIT logo. The antennas are not simply turned off and on in a pattern that traces the logo, as the pixels in a black-and-white monitor would be. All of the antennas emit light, and if you were close enough to them (and had infrared vision), you would see a regular array of pinpricks of light. 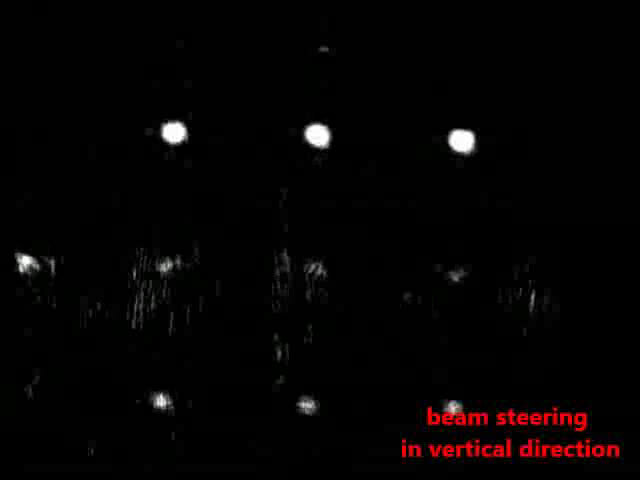 Seen from more than a few millimeters away, however, the interference of the antennas' phase-shifted beams produces a more intricate image. In the other chip, which has an eight-by-eight grid of antennas, the phase shift produced by the antennas is tunable, so the chip can steer light in arbitrary directions. In both chips, the design of the antenna is the same; in principle, the researchers could have built tuning elements into the antennas of the larger chip. But "there would be too many wires coming off the chip," Watts says. "Four thousand wires is more than Jie wanted to solder up." Indeed, Watts explains, wiring limitations meant that even the smaller chip is tunable only a row or column at a time. But that's enough to produce some interesting interference patterns that demonstrate that the tuning elements are working. The large chip, too, largely constitutes a proof of principle, Watts says. "It's kind of amazing that this actually worked," he says. "It's really nanometer precision of the phase, and you're talking about a fairly large chip." In both chips, laser light is conducted across the chip by silicon ridges known as "waveguides." Drawing light from the optical signal attenuates it, so antennas close to the laser have to draw less light than those farther away. If the calculation of either the attenuation of the signal or the variation in the antennas' design is incorrect, the light emitted by the antennas could vary too much to be useful. Both chips represent the state of the art in their respective classes. No two-dimensional tunable phased array has previously been built on a chip, and the largest previous non-tunable (or "passive") array had only 16 antennas. Nonetheless, "I think we can go to much, much larger arrays," Watts says. "It's now very believable that we could make a 3-D holographic display." "I think it's one of the first clearly competitive applications where photonics wins," says Michal Lipson, an associate professor of electrical and computer engineering at Cornell University and head of the Cornell Nanophotonics Group. Within the photonics community, Lipson says, most work is geared toward "the promise that if photonics is embedded in electronic systems, it's going to really improve things. Here, [the MIT team] has developed a complete system. It's not a small component: This system is ready to go. So it's very convincing." Lipson adds that the tuning limitations of the MIT researchers' prototype chips is no reason to doubt the practicality of the design. "It's just physically hard to come up with a very high number of contacts that are external," she says. "Now, if you were to integrate everything so that it's all on silicon, there shouldn't be any problem to integrate those contacts." Really great work! There are many, many applications! Just think if you could do away with the rotation and movement of the arm in a DVD/CD-reader? And you could make LIDARs much more conveniently.. Of course, 3D holographic displays (as mentioned in the article) would be a real killer application.